Note that this is an overview guide and therefore won't go into any real depth about any of the tools but it does provide basic information highlighting the basic features. 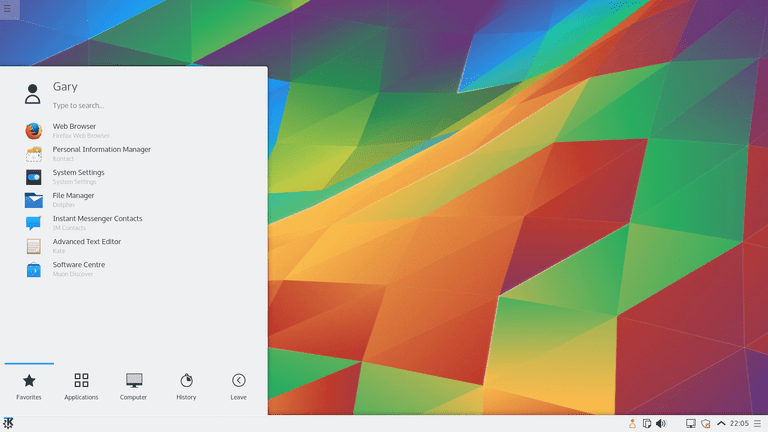 The image on this page shows the default KDE Plasma desktop. As you can see the wallpaper is very bright and vibrant. There is a single panel at the bottom of the screen and in the top left of the screen is a small icon with three lines going through it. The favorites tab has a list of your favorite programs. Clicking on an icon brings up the application. There is a search bar at the top of all the tabs which can be used to search by name or type. You can remove an item from the favorites by right-clicking on the menu and selecting remove from favorites. You can also sort the favorites menu alphabetically from a to z or indeed from z to a. The list of categories is customizable. Clicking on a category shows the applications within the category. You can launch an application by clicking on the icon on the menu. You can also pin the application to the list of favorites by right-clicking and selecting add to favorites. The computer tab has a section called applications which include system settings and the run command. The other section on the computer tab is called places and it lists the home folder, network folder, root folder, and waste bin as well as recently used folders. If you enter a removable drive it appears in a section at the bottom of the tab called removable storage. The history tab provides a list of recently used applications and documents. You can clear the history by right-clicking on the menu and select clear history. The left tab has session settings and system settings. The session settings let you log out, lock the computer or switch user whereas the system settings lets you turn off the computer, reboot it or sleep. To add widgets to the panel click on the panel settings icon in the bottom right and choose add widget. To add widgets to the main desktop right-click on the desktop and choose add widget. You can also add widgets by clicking the icon in the top left corner and select add widget. Regardless as to which widget option you choose the result is the same. A list of widgets will appear in a pane on the left of the screen which you can drag into position either in the desktop or on the panel. There are more available but this is the sort of thing you can expect. Some of them are useful and look good such as the dashboard and some of them look a bit basic and are a little bit buggy. At the bottom of the list of widgets is an icon which allows you to download and install more widgets. The sort of widgets you can download includes Gmail notifiers and Yahoo weather widgets. KDE has a concept called activities. They are a new way of handling virtual workspaces because each activity in itself can have multiple workspaces. Activities let you break your desktops down into features. For example, if you do a lot of graphics work you might choose to have an activity called graphics. Within the graphics activity, you can have multiple workspaces but each one is geared towards graphics. A more useful activity would be for presentations. When showing a presentation you want the screen to remain on without going to sleep and without going to the screensaver. Your default activity would be a normal desktop which times out and shows the screensaver after a short period of use. As you can see this is quite useful because now depending on what you are doing you have two different sets of behaviors. Akregator is the default RSS feed reader within the KDE desktop environment. An RSS reader lets you get the latest articles from your favorite websites and blogs using a single desktop application. All you have to do is find the path to the feed once and every time you run Akregator the list of articles come through automatically. The audio player within KDE is called Amarok and it is superb. The main thing that KDE gives you is the ability to customize pretty much everything about the applications that belong to it. The default view within Amarok shows the current artist and a wiki page for that artist, the current playlist and a list of music sources. Access to external audio players such as iPods and the Sony Walkman is hit and miss. Other MTP phones should be ok but you would have to try them out. Here is a comparison between Amarok and Clementine. The Dolphin File Manager is fairly standard. There is a list of places down the left side which points to places such as the home folder, root and external devices. You can navigate through the folder structure by clicking on a place and clicking on the folder icons until you get to the folder you wish to see. There is full drag and drop capability with move, copy, and link. Access to external drives is a bit hit and miss. The default media player within the KDE desktop environment is Dragon. It is a fairly basic video player but it does the job. You can play local media, from a disc or from an online stream. You can toggle between windowed mode and full screen. There is also a widget that can be added to the panel. Kontact is a personal information manager which incorporates many of the features you could expect to find in Microsoft Outlook. There is a mail application, calendar, to-do list, contacts, journal and RSS feed reader. The mail application incorporates the features of KMail although KMail exists as a separate application in its own right within the KDE desktop. The contacts provide a way for you to add the names and address of all your contacts. It is a bit clunky to use. The calendar is linked to KOrganiser which lets you schedule appointments and meetings much like Microsoft Outlook. It is fairly fully featured. There is also the to-do list which is much like the task list within Outlook. This guide provides more information about KNetAttach and how to use it. The default IRC chat client that comes with the KDE desktop is called Konversation. When you first connect a list of servers appears with the option to add and remove servers. To bring up the list of channels press the F5 key. To get a list of all the channels, press the refresh button. You can limit the list by the number of users or you can search for a particular channel. You can join a room by clicking on the channel within the list. Entering a message is as simple as typing it in the box provided at the bottom of the screen. Right clicking on a user lets you find out more about them or block them, ping them or start a private chat session. KTorrent is the default torrent client within the KDE desktop environment. Many people think of torrent clients as a way to download illegal content but the truth is it is the best way to download other Linux distributions. Download sites will generally give you a link to the torrent file which you can download and open within KTorrent. KTorrent will then find the best seeds for the torrent and the file will begin to download. As with all KDE applications, there are literally dozens of settings that can be applied. The KDE desktop environment has a built-in screen capture tool called KSnapshot. It is one of the better screenshot tools available within Linux. It lets you choose between taking shots of the desktop, a client window, a rectangle or a freeform area. You can also set a timer to define when the shot will be taken. KDE also has an image viewer called Gwenview. The interface is very basic but it provides enough features to let you view your image collection. Initially, you can select a folder which you can then step through. You can also zoom in and out of each image and view the image at its full size. The KDE desktop is highly customizable. As well as being able to add different widgets and create activities you can tweak every other part of the desktop experience. You can change the desktop wallpaper by right-clicking on the desktop and choosing desktop settings. This really lets you choose the desktop wallpaper and not much more. The appearance settings let you change the theme and splash screen. You can also customize cursors, icons, fonts and application style. The workspace settings have a whole host of settings including turning on and off dozens of desktop effects such as mouse animation, magnifiers, zoom functions, fade desktop etc. You can also add hotspots for each workspace so that when you click into a particular corner an action happens such as​ an application loads. Personalisation ​lets you customize things about user manager, notifications and default applications. Networks let you configure things like proxy servers, SSL certificates, Bluetooth and windows shares. Finally, hardware lets you deal with input devices, power management and all the things you would expect to be handled under the hardware section including monitors and printers. As mentioned at the beginning of the article, this is an overview of the KDE Plasma desktop environment highlighting the tools and features available.